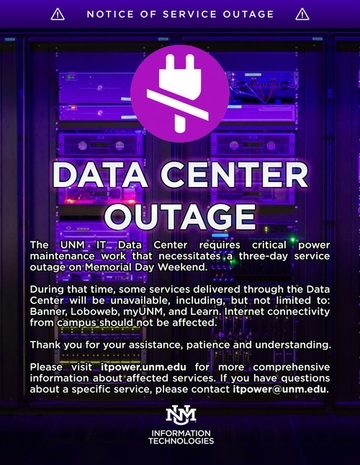 The University of New Mexico’s Information Technologies department is preparing for a three-day service outage required to address a critical power maintenance issue at the UNM IT Data Center. The outage, scheduled for Memorial Day weekend May 25-28, will impact a number of services across campus. Power to the UNM IT building will be shut off during the required maintenance, so services delivered by or through the IT Data Center will be unavailable during this time. These services include, but are not limited to Banner, Loboweb, myUNM, and Learn. Internet connectivity from campus should not be affected. Leverage supplemental communication mechanisms to help us keep the campus community involved and well informed. The critical power maintenance work necessitates a three-day service outage beginning Friday, May 25 at 5 p.m. and concluding Monday, May 28 at 5 p.m.
UNM IT is currently reviewing options to maintain LoboMail service during the outage and will keep the campus informed of its progress. UNM IT’s highest priority is to ensure that life-safety services are identified and remediated. The decision and project planning was determined by Information Technologies Governance Council, which is aimed at maintaining continuity of IT services in the long-run, but requires a temporary impact to campus technology services. 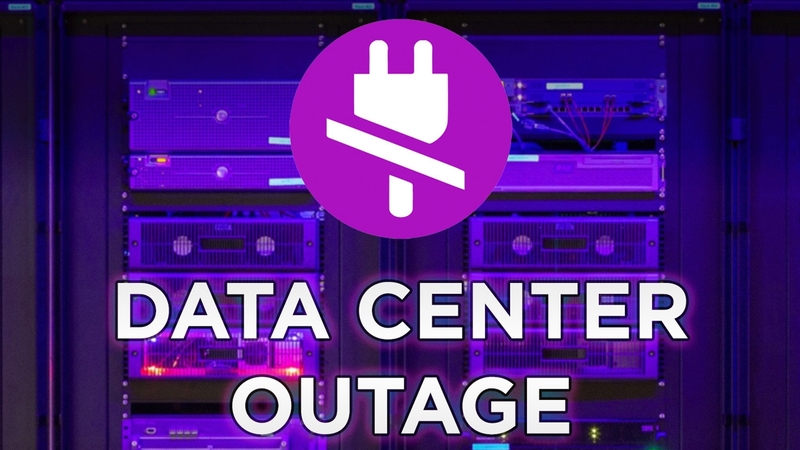 This maintenance must be completed to ensure reliability and availability of IT services and to mitigate the risk of lengthy unplanned service outages related to power disruptions to the data center. UNM IT has been reaching out to stakeholders throughout the UNM community to confirm the timeframe and to notify users about the work that must be completed prior to and during the maintenance. In addition, a website, itpower.unm.edu, has been created to provide more comprehensive information about affected services. If you have questions about a specific service, contact itpower@unm.edu.